Published by BMW and Bike in 2010. 99 pages of fantastic information, details, colour photos and diagrams etc showing the full story of the iconic BMW GS. BMW R1200 Twins (04 - 09). Haynes Manual. Keep your BMW in perfect running order and maintain it's value with this service and repair manual. Haynes shows you how and saves you money. This manual is a must, gives you step by step instructions clearly linked to hundreds of photos and illustrations. R1150R Rockster 1130cc03 - 05. R1150GS 1130cc00 - 03. R1150GS Adventure 1130cc02 - 06. R1150R 1130cc01 - 06. Keep your BMW in perfect running order and maintain it's value with this service and repair manual. 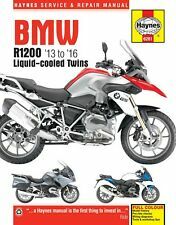 Haynes Manual BMW R1200 dohc liquid-cooled Twins 2013 to 2016. 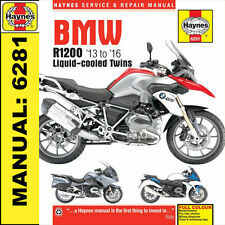 Haynes' coverage of BMW's R1200 range continues in this new manual covering the liquid-cooled engined models. In all over 1300 photographs have been taken. BMW R850, R1100, R1150 & R1200C 1993-2005. R1150RS (U.K.)2001-2003. R1200C (U.S. and U.K.)1998-2004. R1150RT (U.K.)2000-2004. This hands-on experience combined with extensive research results in a manual that is both user-friendly and detailed. BMW Airhead Motorcycle book collection. My collection of BMW Airhead books is for sale. BMW R850, 1100 & 1150 4-valve Twins (93 - 04). Keep your BMW in perfect running order and maintain it's value with this service and repair manual. Haynes shows you how and saves you money. This manual is a must, gives you step by step instructions clearly linked to hundreds of photos and illustrations. BMW R90/S SILVER SMOKE MOTORCYCLE METAL SIGN. (A3) SIZE VINTAGE BMW MOTORCYCLES. SIZE 400MM X 300MM X 0.7MM ALUMINUM PLATE. HOLES IN EACH CORNER FOR FIXING. HIGH GLOSS FINISH. 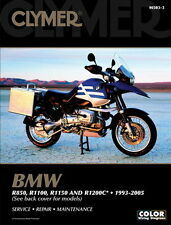 Here we have for saleGENUINE 2009 BMW R 1200 RT OWNERS MANUAL in good, usable condition. USED, 10 YEARS OLD BOOK. If you are unhappy for any reason we can help. Ireland and the. 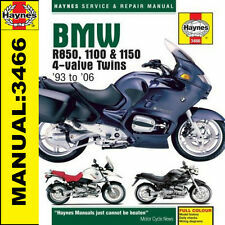 BMW R 65 LS (Europe) 1981-1985 Manuals - Haynes (Each). 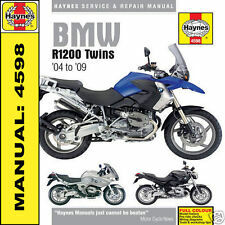 BMW R80/7 - R100T - R100RT - R100S - R100RS OWNERS TECHNICAL DATA AND SERVICE US MODELS BOOK HANDBOOK UNUSED SERVICE SECTION NO SERVICE STAMPS ALL SERVICE STICKERS STILL IN PLACE NOT HAYNES. USED paper manual for This USED Paper manual has been thoroughly checked and is complete, it contains416 Pages. There may also be writing or scruff marks on the manuals, but they are all in very good condition and 100% complete. To Fit Model : BMW F 650 GS 10. Subtype : Manual. To Fit Make Call01302 338600. Book - BMW Twins & Singles by Roy Bacon. 1st edition pub. in 1982 - this. at the back giving specifications, colours, model recognition points etc. The book is in. Complete coverage for your BMW R nineT (14 - 18). R nineT 14 - 18. Racer 2018. Urban G/S 2018. With a Haynes Manual, you can do it yourself, from simple maintenance to full repairs. Every Manual is based on a complete stripdown of the bike. This Haynes BMW Super Profile Book is the 1983 hardback edition and covers the R69 & R69S models produced between 1955 & 1969. This BMW Original Service Record Booklet would have been supplied new with the 3-Series (E30), 5-Series (E28), 6-Series (E24) & 7-Series (E32) models that were in production during 1987. A rare opportunity to obtain this original service booklet. For BMW 8 valve R series 'Oilhead' BMW Twins. Motorworks UK are the UK's largest independent supplier of new and used parts for BMW motorcycles. Don't be afraid to ask if you require any further information regarding a listed item. BMW PART NUMBER: 01 41 8 554 761. Here we have for saleGENUINE 2014 BMW S 1000 RR OWNERS MANUAL in good, usable condition. USED, 5 YEARS OLD BOOK. If you are unhappy for any reason we can help. Ireland and the. R100T 979cc 79 - 80 USA R100ST 979cc 1980 / USA R100TR 979cc 82 - 83 / USA R100SP 979cc 82 - 83. UK R80ST 797cc 82 - 84 / USA R80ST 797cc 83 - 84 / UK R80R 797cc 1994. UK R80G/S 797cc 80 - 87 / USA R80G/S 797cc 81 - 86 / UK R80GS 797cc 87 - 94. 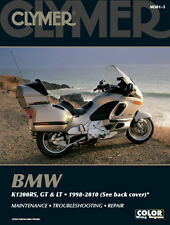 Here we have for saleGENUINE 2004 BMW K 1200 S OWNERS MANUAL in good, usable condition. USED, 15 YEARS OLD BOOK. If you are unhappy for any reason we can help. Ireland and the. SIZE 410MM X 285MM X 1MM PLATE. HOLES IN EACH CORNER FOR FIXING. HIGH GLOSS FINISH. BMW R90/S SILVER SMOKE MOTORCYCLE METAL SIGN,1970'S BMW.VINTAGE BMW MOTORCYCLES. SIZE 200MM X 285MM X 0.7MM ALUMINUM PLATE. HOLES IN EACH CORNER FOR FIXING. VIBRANT HIGH GLOSS FINISH. 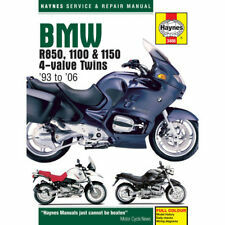 BMW R 1200 GS Adventure (Europe) 2010-2012 Manuals - Haynes (Each). UK R65 649cc 78 - 88. USA R65 649cc 79 - 87. UK R80 797cc 84 - 94. USA R80 797cc 85 - 87. UK R50 498cc 70 - 73. USA R50 498cc 69 - 73. Haynes Manuals produce a wide range of informative, practical manuals and books suitable for novices and experts alike. R1200GS 1170cc 10 - 12. R1200RT 1170cc 10 - 12. R1200R 1170cc 11 - 12. R1200GS Adv 1170cc 10 - 12. Haynes Manuals produce a wide range of informative, practical manuals and books suitable for novices and experts alike. BMW PART NUMBER: 01 41 8 558 951. Here we have for saleGENUINE 2014 BMW R 1200 GS OWNERS MANUAL in good, usable condition. USED, 5 YEARS OLD BOOK. If you are unhappy for any reason we can help. Ireland and the. Here we have for saleGENUINE 2015 BMW C 650 SPORT OWNERS MANUAL in good, usable condition. BMW PART NUMBER: 01 41 8 563 161. USED, 4 YEARS OLD BOOK. Ireland and the. BMW PART NUMBER: 01 41 8 525 181. Here we have for saleGENUINE 2011 BMW C 600 SPORT OWNERS MANUAL in good, usable condition. USED, 8 YEARS OLD BOOK. Ireland and the. BMW Motor Cycles Original Sales Brochure From 1955 MODELS COVERED R25/3 R50 R67 R69 PUBLICATION No M217e IV 55. FORMAT 36 Page Spiral Bound Brochure. LANGUAGES English. ILLUSTRATIONS Black & White. SIZE APPROX 9 ½”x 7 ¾”. CONDITION Overall condition is GOOD/VERY GOOD. Handling marks & minor soiling throughout with scuffs to the corners/edges & spine. The cover looks a little worn, with some creases and faint storage marks on it. Please see attached photographs and if you require any further details we will be only too happy to assist. Genuine BMW F 650 F 650 ST Riders manual.